Delhi Assembly’s winter session today got off to a tumultuous start, with the opposition BJP MLAs protesting against the hike in water tariff by rushing to the well of the House, shouting slogans and some even climbing atop desks and drumming on their tables with detachable mikes. Hundreds of activists of the CPI (M) took part in dharnas at Faiz Road, Bhajanpura, Dabri, Azadpur, Meethapur (Badarpur) and Kapashera to protest against the increase in water tariff, move to privatise the Delhi Jal Board and the ill-effects of privatisation of electricity distribution. The Delhi Metro will move from the elevated rail to the underground tracks on Sunday when Prime Minister Manmohan Singh opens its four-km-long first underground section between Kashmere Gate and Delhi University. There is at least one day in the year, when the war memorial, built at Town Park in Sector- 12 here, witnesses some activity. The spot normally remains closed throughout the year except the Vijay Diwas, which is observed on December 16 every year. A woman was literally purchased for Rs 50,000 for marriage to a person, who was a resident of Sakipur village in Surajpur. The marriage was solemnised in Gahaziabad on December 8. A Delhi University research scholar today was injured seriously after an outsider had allegedly hit her with an iron rod. She was taken to the nearby hospital where her condition was said to be under control. A woman’s ear was allegedly bitten off by another woman in Kapra colony of the NIT here this morning after a quarrel over drinking water. While the victim has been admitted to the civil hospital for treatment, a case has been reportedly booked in this regard. The government has sanctioned Rs 85 crore for modernisation of the Anand Vihar Railway Station. Mother’s Pride Pre-School celebrated its annual sports day yesterday at the Talkatora Stadium here. The show titled, ‘Torchbearers of the Future’ was a fun-filled affair with over 2,000 children in the age group of 2 to 4 years showcasing their sporting prowess. As a part of its ongoing golden Jubilee celebrations, the Lalit Kala Akademi (LKA), National Academy of Arts, India’s apex cultural body in the field of visual arts, is organising a two-day long interactive workshop on New Media, NeuVe* (New Way). With the arrest of two persons, the Kavi Nagar police claims to have busted a gang of fake driving licence makers in Ghaziabad. With the arrest of two persons, the Crime Branch of the Delhi Police claims to have busted a bank draft racket and seized drafts worth Rs 22 lakh along with other documents from their possession. The police have booked a case of fraud against a woman of Mandhkaul village of Ballabhgarh subdivision for duping the branch of a bank at Fatehpur Billauch village, of about Rs 1.10 lakh. The pandemonium started during Question Hour soon after the obituary references, with the opposition BJP demanding an adjournment motion over the water tariff hike, which Speaker Prem Singh rejected. Rising to their feet, the BJP MLAs insisted on adjournment of the other business for the day for a discussion on new water rates. 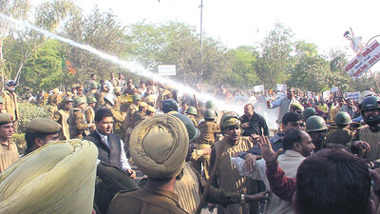 They raised slogans against the Sheila Dikshit Government. “We want to move a motion demanding that the new water tariff be withdrawn immediately. We are asking for an adjournment motion as the issue is of great public importance,” Leader of Opposition Jagdish Mukhi said. Some BJP legislators even rushed to the well of the House, and a couple of MLAs–Kulwant Rana and Motilal Sodhi–climbed on to the desks to press their point, while Rana and Ramesh Bidhuri even detached their mikes from the holders and banged them against their tables. As a result of the kerfuffle, which consumed most of the Question Hour, the Speaker adjourned the House, but the situation did not improve when the House reassembled, following which the Speaker asked the BJP MLAs to leave the House. The BJP MLAs stayed away from the House for the rest of the day, with two Bills getting passed in their absence. They did not attend the short-duration discussion either in the second half of today’s proceedings, which was on the new water tariff. Making a statement on the issue during the short-duration discussion, the Chief Minister charged the BJP with trying to politicise the matter. “I am confident that people have understood the reasons for the tariff hike. It has taken place after six years, and it was due to certain compulsions like rise in the cost of power, raw water and chemicals used to clean up water,” Mrs Dikshit said. Despite the recent change in water tariff, the cost of water in Delhi was lower than that in many other cities, she added. The dharnas were addressed by S B Bharadwaj and Baldev Singh, party state secretariat members, and Rampal, I.S. 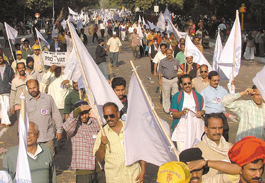 Biltoria, Sudhir Kumar, Asha Sharma, Jagdish Manocha, Nathu Prasad, Rehana Sayeed, Sonia Verma, Prasenjit Bose and Anurag Saxena, party state committee members. The speakers condemned the increase in rates of water as an additional burden, especially on the poor and the working class. Till now, a sum of Rs 30 was paid for up to 20 kilolitres. This has been increased threefold to Rs 1,171. This massive increase is the first step towards privatisation. There is a huge shortfall between supply and demand of water for most parts of the city. This is the result of unequal distribution, 40 per cent transmission losses, pilferage by industry and individual consumers, unchecked private tube wells in rich colonies, etc. Instead of addressing these issues, the Delhi government is penalising the people, lamented many leaders. Delhi also faces frequent power cuts and billing problems. T and D losses are around 45 per cent. The Rs 3,500-crore subsidies provided by the Delhi government in two years to the private distribution companies are far higher than earlier DVB losses. The favours shown to private parties—BSES and Tata Power—have adversely impacted on tariffs and outflows from the state exchequer. JJ colonies have been left at the mercy of private contractors. Privatisation of power distribution has obviously failed. The speakers demanded reversal of hike in water rates, stopping plans for privatising the Delhi Jal Board, reversal of privatisation of DVB and roll-back of power tariff. “It’s going to be a historic occasion for us,” Delhi Metro Rail Corporation (DMRC) Managing Director E Sreedharan told reporters, who took a pre-inaugural ride in the underground section. Besides its modern technology and complex construction, the underground section with four stations, namely Kashmere Gate, Civil Lines, Old Secretariat and Delhi University, will also have indigenously built trains. “The Prime Minister will be flagging off a ‘Made in India’ Metro train,” said Mr Sreedharan. A passenger will be able to complete the four-km Kashmere Gate-Delhi University journey in six-and-a-half minutes at a cost of Rs 6. There will, however, be no concessions for Delhi University students. There will be as many as 293 trips down the line a day from 6 am to 10 pm, including a train every 10 minutes between 6 am and 8 am, every six minutes between 8 am and 2 pm and every 10 minutes between 8 pm and 10 pm.. The new underground corridor is expected to benefit those travelling from Shahadra and Rithala where the elevated Metro is run at present. The Kashmere Gate Metro station will act as an interchanging station for the passengers going to Civil Lines, Old Secretariat and Delhi University from Shahadra and Rithala. Mr Sreedharan said the section would overshadow the London Metro in safety and ventilation and air-conditioning facilities. Frontline technology has been used against accidents. “There is no chance of collisions. Signal failure is only one in a million years,” said DMRC Director Santosh Kumar. The lights and ventilation will work even in case of a power failure, he added. 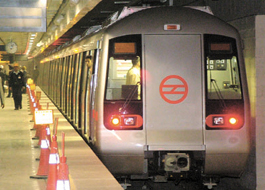 DMRC expects about 20,000 passengers to use the new underground corridor and another about 10,000 using the interchanging facility between Shahadra-Rithala and Delhi University. “We expect heavy traffic in the first two months as the people will be curious,” said Mr Sreedharan. The work on the underground section began in May 2001 with the DMRC facing many challenges in shifting public utilities like sewers and water, power and telephone cables as well as diverting traffic on roads above. The section goes operational seven months ahead of schedule. The 70-km first phase of the Metro, which is expected to be completed by December next year, will serve people travelling to Connaught Place and Central Secretariat. It is also expected to ease the chaos on roads and pollution and accidents by about 50 per cent. There is at least one day in the year, when the war memorial, built at Town Park in Sector- 12 here, witnesses some activity. The spot normally remains closed throughout the year except the Vijay Diwas, which is observed on December 16 every year. Vijay Diwas is celebrated in the memory of the victory of the Indian Army against Pakistan troops in Bangladesh in 1971 war. The Zila Sainik Board organised a function at the memorial this morning to pay tributes to the soldiers and officers of the defence, who had sacrificed their lives for the country. The local administration also honoured some of the ex-servicemen at the occasion. But the number of the retired defence personnel and their families, who had been invited or had been present on the occasion, was below the expectations. Only five ex-servicemen, who had been over 75 years of age, were honoured on the occasion, while it is learnt that the number of ex-servicemen and their kin had been in thousands. The board perhaps has no information about the widows or families of the nine soldiers and officials, who had laid their life in the Bangladesh operation in 1971, as none of the kin of those martyrs had been present at the occasion. The Deputy Commissioner, officials of the Zila Sainik Board, retired officers and jawans from the three wings of the Defence, who had been present on the occasion paid their tributes by laying wreathes on the memorial. It may be recalled that the Commander of the Pakistan forces, Lt-Gen A. K. Niyazi had surrendered along with 93,000 Pakistani troops before the Indian army led by Lt-Gen S. S. Arora on this day in 1971 war. The state government had built a memorial in Sector-12 here, where one of the fighter planes used by the Indian Air Force in this war has also been displayed at the memorial. But the maintenance of the aircraft and the spot on the overall is reported to be poor. It is reported that some cleaning was done a day before the ‘Vijay Diwas’ as a function was to be held on this day. A small building here, which houses the photographs and models of the defence personnel and equipment normally remain closed through out the year and anyone who want to see these would have to wait till one comes from the office concerned to open the lock of the room. The description plate, which is required to put near the old aircraft, also goes missing except this day. The wired enclosure around the aircraft was not also maintained properly, as kids could be seen climbing on the aircraft that was once the pride of Indian Air Force. The plane had been flown by Squadran Leader K. K. Gunjan of the Air Force in the 1971 war. A woman was literally purchased for Rs 50,000 for marriage to a person, who was a resident of Sakipur village in Surajpur. The marriage was solemnised in Gahaziabad on December 8. But the wife gave the slip to her husband and her in-laws and decamped Rs 50,000. On Tuesday, the police said, some relatives from girl’s family came and after giving the family poison-laced tea, they decamped with valuables worth Rs 50,000 taking the bride along. The police, who said that a professional gang was involved in the fraud, have registered a case against the bride and the other members of the gang. According to the SO of Surajpur police station, Sher Bahadur Singh, Rajiv was finding it difficult to get married. In the meantime, he developed friendship with a Ghaziabad resident. This man told Rajiv that he could arrange his marriage to a girl from Mohakanpur village in Meerut. But the rider was that he would have to shell out Rs 50,000 for the marriage. On December 8, some people, including women, came with a girl, Poonam. Later, the uncle of the groom, Prem handed over Rs 50,000 to them and the marriage was solemnised in the house of an advocate. They told Poonam to serve tea to all of them. Poonam had reportedly mixed some sedative in the brew. About a dozen of Rajiv’s relatives, his mother, uncle Prem and others became sick and lost consciousness. The members of the gang, fled from there with Rs 50,000 and other valuables from the house along with Poonam. A car was blown up in the air when a gas cylinder fitted in it exploded near Old Bus stand, seriously injuring the car driver. To stop such explosion and accidents, police have challaned 163 vehicles having similar illegal gas kits. When a Maruti car reached near old bus stand at 9.30 am yesterday, an explosion took place, blowing the car into shreds. Panicky people were seen running helter-shelter all around the bus stand. Apart from Naseem of Mussorie, Riazuddin and Bhure, the driver and another person in the front seat had a miraculous escape, but Riazuddin on the rear seat was gravely injured. Later, he has been admitted to a local hospital. Soon a fire brigade vehicle arrived on the scene and extinguished the blaze. The car belonged to Nasimuddin of Mussorie. He was heading towards Gazipur in Delhi. Natasha Sharma, a research scholar in East Asian Studies, Arts faculty, was on her way to the hostel when one Bhaskar Bohra, an outsider, allegedly attacked her with an iron rod. The police have arrested the accused on the complaint of the scholar and seized the rod that was allegedly used to hit the victim. He also said that the police should increase the pickets in the area and random checking to protect the students and teachers in the area. The Sagar School celebrated its fifth founder’s day recently. The school is an Indo-European residential, co-educational venture spread over 142 acres and was opened by Dr Vidya Sagar four years back. The school has swimming, squash, basketball and other outdoor and indoor games for students. Besides, the school offers photography, murals, pottery, candle-making, tie and die, ceramics glass paintings, etc. Manav Sthali Commerce Association organised their 10th annual inter-school ‘Comonomics Carnival’, which allowed the students from various schools to exchange views on the current developments in commerce and economics. CFO, ADIDAS, Mr Sunder Kalra declared the event open and Mr Amitava Bhowmick, Senior Design Officer, SISI was the judge for ADMART, a designing contest which tested the creative skills of the participants. The school also hosted an Institutional Quiz contest. Dr Vinay B Kamble, Director, Vigyan Prasar, Dept. of Science and Technology, was the chief guest on the occasion. According to a report, the incident took place when the victim, identified as Durgesh Devi, wife of one Prem Chand, was involved in a spat with her neighbour over the use of the supply of tap water. It is learnt that while her husband was getting water from the common tap in the house, where many tenants had been residing, one of their neighbours identified as, Raju came and started washing his hand, while the pot was still under the tap. Prem Chand objected to this act. Subsequently, a quarrel erupted, which was joined in other family members of both sides. Later, mother of Raju, who could not be identified, got involved into a scuffle with Durgesh and bit off one of her ear. It is stated that the flap of the ear came off and fell down, before other neighbours rush to get them separated. She was admitted to a hospital. The Minister of State for Railways R Velu informed the Lok Sabha today. The project envisages construction of three platforms, two washing lines and three stabling lines along with other necessary service building infrastructure, he told the House during the Question Hour. Replying to a supplementary, he said, a survey has been conducted for connecting Delhi and Noida on the request of the latter. The report of the survey was submitted in 1999. The cost of the 29.18 km line was estimated at Rs 110.32 crore, he said. Mr Velu said a survey has also been conducted for new broad gauge line from Tuglakabad to Dadri via Noida in 2000. The length of the alignment was 35.80 km and the cost was estimated at Rs 287.58 crore. Mr Sunil Dutt, Minister of Sports and Youth Affairs, Government of India, was the chief guest and the guest of honour was Major Rajavardhan Rathore, silver medal winner in Olympics 2004. Other guests included prominent dignitaries, educationists and personalities of the day. The grandparents of the children were the special invitees. Mr Sunil Dutt told the audience that the achievements of the present generation were many and varied, but the torch must now be passed to the little ones—the future citizens of India..
Major Rathore in his address said that he could identify with the proud parents of the little ones performing today as he himself was the father of a two and a half year old girl. The show itself was a spectacular pageant that began with a guard of honour. This was followed by the inauguration ceremony and the speech of welcome by Mrs Sudha Gupta, Founder and Chairperson, Mother’s Pride. The interactive workshop on New Media with be on for two days from December 21. It will be conducted by Nikhil Bhardwaj, a designer trained at the National Institute of Design, with a penchant for exhibition design and new media and Leidi Haaijer, a Dutch multi-media artist trained at the Royal Academi, who has specialised in public art projects. The workshop is an attempt to encourage the use of elements of colour, form, pattern, structure and construction in a creative way to explore the relationship between design/graphics and Indian art traditions. It will provide participants an insight into how design and visual constructions are created and evolved. The participants will have the joy of playing and experimenting, and the benefits of learning and discovering through the workshop. With the arrest of two persons, the Kavi Nagar police claims to have busted a gang of fake driving licence makers in Ghaziabad. A number of rubber stamps of Regional Transport Officer, readymade licences and computers used for making complete licences were recovered from them. The SP (City) Umesh Srivastava said police had got some intelligence reports that a gang of fake licence makers was active in the city. They were mostly agents and touts working around RT office. The accused were identified as Amarjit of Peela Quarters, Sihani Gate and Devi Singh of Maliwada in this connection. The arrested criminals had confessed to their crime, the SO Sunil Somanya said. About a dozen semi-finished licences and complete licences were recovered from them. Rubber stamps, application forms, computers, printers etc. were seized from the accused. They used to charge Rs 300 for one licence. Further investigation are on. In a sleek operation, some unidentified criminals snatched a bag containing Rs 3 lakh from a trader in Gandhi Nagar in Ghaziabad. Surprisingly, the police did not get the wind of the sensational crime in the heart of the city. There was a virtual chaos and confusion in the police department on getting the news of the loot. At first, the amount of loot had been mentioned as Rs 5 lakh, but later on cross checking it was stated to Rs 3 lakh. When the victim, Sachin Garg reached Ram Nagar Karyana Mandi crossing, some criminals hit his scooter with their motorbike. As Garg fell down, the criminals snatched his bag containing Rs 3 lakh and fled from the spot. The criminals were seen fleeing towards Tarab Nagar. Further investigation is on. With the arrest of two persons, the Crime Branch of the Delhi Police claims to have busted a bank draft racket and seized drafts worth Rs 22 lakh along with other documents from their possession. The accused have been identified as Ahmed Khan (30) and Keshav Kumar (23), both residents of Bihar. Based on a tip-off the police sent a decoy customer and subsequently nabbed him in the Rohini area. During interrogation, Ahmed told the police that he came into contact with one Devender Rana and started preparing bank drafts of Indian Bank, State Bank of India and Oriental Bank of Commerce. They used the ‘screen printing’ technique to manufacture the drafts. Ahmed also disclosed that that he had been in the business for the last five months and recently purchased 500 sarees from one Jamina Ahmed in Tilak Nagar by issuing a fake bank draft worth Rs 35,000. The police have booked a case of fraud against a woman of Mandhkaul village of Ballabhgarh subdivision for duping the branch of a bank at Fatehpur Billauch village, of about Rs 1.10 lakh. The fraud came to light when the real claimant of two fixed deposits, of the above stated amount came to withdraw the amount after maturity. It is stated that due to mistaken identity, the bank had sent a letter to another woman of the same name, in the same village. According to the complaint lodged by the manager of the branch, the fixed deposit belonged to one Mayadevi, wife of Mohar Pal, but the amount was ‘fraudulently’ withdrawn by Mayadevi, wife of Mahipal, after a letter was ‘wrongly’ despatched to her on maturity of the account. It is alleged that the accused got the name of her husband replaced with that of original person on the papers, before getting the amount illegally.